Have you looked after yourself today? 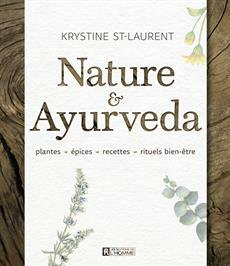 Krystine St-Laurent introduces us to wisdom passed down through thousands of years, based on drawing on the best of nature to care for, soothe, nourish and regenerate both body and mind. A former nurse, and now a herbalist, certified aromatherapist and passionate practitioner of Ayurvedic medicine, the author urges us to reconsider our relationship to health and our understanding of overall well-being (body-heart-mind); she guides us as we discover a way of life that incorporates nature and returns plants and spices with surprising bene ts to their rightful place. Living foods, meditation, aromatherapy, self-massage with oils – Krystine St-Laurent suggests wellness rituals adapt- ed to our western way of life, using plants easily found in our gardens and grocery stores, allowing us to reconnect with nature, so beneficial to our equilibrium, and thus to rediscover our essence. An invitation to rediscover the pleas- ure of taking care of ourselves...in a completely natural way. To date, no other book has dealt with Ayurvedic medicine in this way, from the perspective of how to apply and adapt it to a western lifestyle. Several beauty recipes and wellness rituals teach us how to integrate Ayurvedic philosophy into our daily routine and improve our overall health. The book contains a wide range of information on plants, their history, how to grow them and how to use them.